Hollybeary Creations : YNS April Sneaks!! It's time for a new release from Your Next Stamp and this month is full of Fun new products!! All the new products will be available in the shop at 10pm est tonight and be sure to join our Blog Hop over on the YNS blog at 10pm as well for a chance to Win a Gift Certificate to the store. Head over to the blog now to see more sneaks from the rest of the team and special guest!! 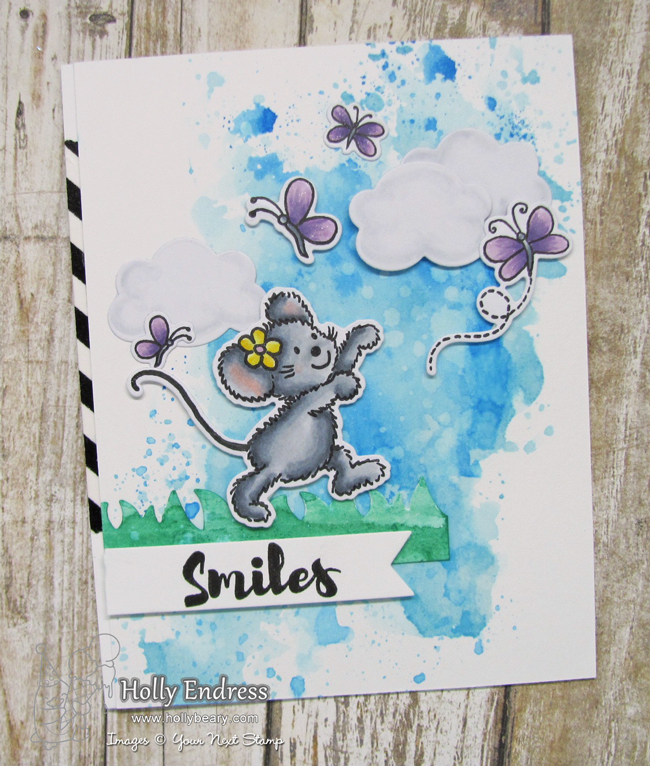 My sneak project features the Fun new Flowers and Smiles Stamp and coordinating die set. This is a cute set featuring Adorable little mice images and butterflies. Sure to put a smile on anyone's face! I trimmed a piece of Distress Watercolor paper to 4 x 5 1/2" and created a Blue wash with some Salty Ocen and Tumbled Glass Distress Inks. 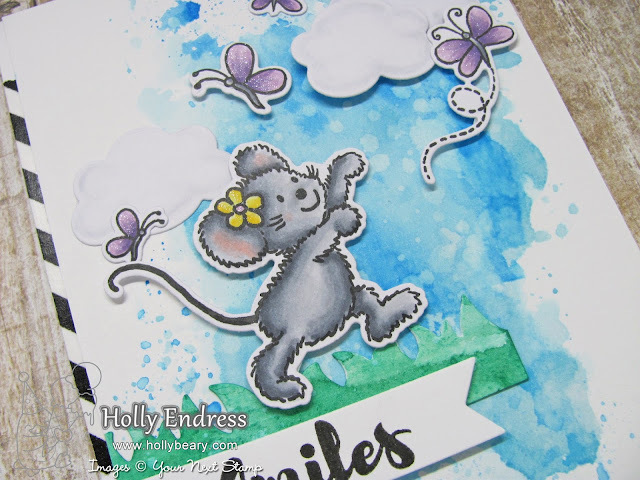 I die cut a few clouds from the Rainbow Fun die set and added some shading with Copic Markers. I stamped the mouse and butterfly images onto some X-Press It Blending cardstock with YNS Black Olive ink. The images are colored in with Copic markers and I used the coordinating dies to cut them out. I adhered the images and the Clouds with some foam adhesive to create a scene. I die cut the Chunky grass die from some watercolor paper and I added some Lucky Clover Distress Ink to it. I adhered it just under the mouse image and trimmed it to fit along the edge. Using the Fishtail/Banner Die set one I created a sentiment banner and adhered it over the grass die. I covered the entire panel with foam tape and adhered it to a top folding A2 size White card base. I added a small piece of some Black and White stripped Washi along the edge of the card base before I adhered the main panel as well. For a bit of sparkle, I added some Clear Wink of Stella to some of the images. 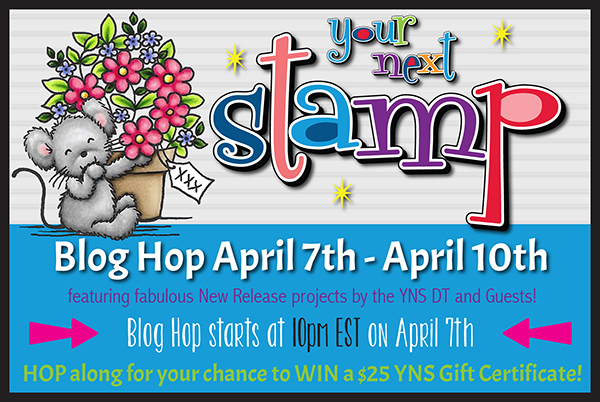 Head over to the YNS blog for more inspiration from the release and don't forget to join us for the hop at 10pm est!! How cute is this little mouse !